Paul Lewis must have been a very young man when Harmonia Mundi first signed him in the late 1990s. But their faith in him has proved well-founded, and has led to an impressive series of releases of the core solo and concerto repertoire, as consistently well performed and recorded as any comparable project of the modern era. Now the company has taken to repackaging and releasing some of these back issues, and is doing so in interesting ways. All of Lewis’ Beethoven and Schubert recordings are now available to download, and some are only available that way. There is no suggestion, though, that the company is giving up on physical media, which is a relief given the high production standards they always lavish. For this new release, an old recording has been combined with a recent one: Disc two (Sonatas D 959 and 960) was recorded in 2002, while disc one (D 784 and 958) was recorded in 2013. The consistency between the two recordings is remarkable, both in terms of Lewis’ interpretation and the high quality of the recording. 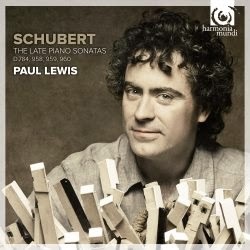 And together, they make up a set of Schubert’s “Late” Sonatas that is arguably as good as any on the market. Lewis never goes to extremes, but that doesn’t mean that he is ever middle-of-the-road either. His tempos are moderate and his rubato is minimal, although phrases are always elegantly shaped. Compare, for example, his opening of the Sonata in A Minor, D 784, with Uchida’s. Where she dwells on individual notes and rushes headlong into the dotted rhythms, Lewis instead plays the whole passage very evenly, and with a deft touch to his piano that gives this opening all the atmosphere it needs. As a pupil of Brendel, we might expect to hear emphatic articulation and a dryness to the phrasing. But while, Lewis certainly has the definite, focussed touch of Brendel, his is a more flowing, rounded Schubert. Most significantly, Lewis always lets the melodies lead. Schubert rarely goes more than a few beats without introducing some melodic idea, and under Lewis’ hands all these lyrical lines take centre stage. The accompanying figures are varied and nuanced, giving a range of satisfyingly warm supporting textures, but the hierarchy is clear – the melodies always come first. Both recordings were made at the Teldex Studio in Berlin, and both give a seemingly identical sound profile to the piano, warm but clear, and with the emphasis on immediacy and presence. Add to all that some fun packaging, with various pictures of Lewis holding a wicker basket of piano keys, those keys also printed on the discs themselves, and this adds up to a very attractive set.